Sure, most middle school students listen to hip hop music, and most probably dance to it, but how many students spend their summers learning to play hip hop music…on the violin? For Make Music NOLA students, this was the focus of their summer camp experience, and a small part of the 140 hours they put into the program this year. That’s how much time each student in Make Music NOLA spent studying, learning, practicing, and playing music this past year, from hip hop, to blues, to original New Orleans tunes, a total of 140 hours of practice. 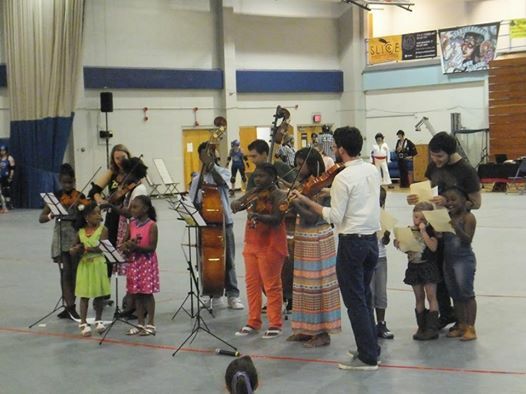 Make Music NOLA (MMN) is a rapidly growing string program in New Orleans 9th Ward and Central City. Offering instruction on violin, viola, cello, and bass; our students attend classes four days a week after school, participate in workshops with guest artists, and perform up to eight community based concerts a year. 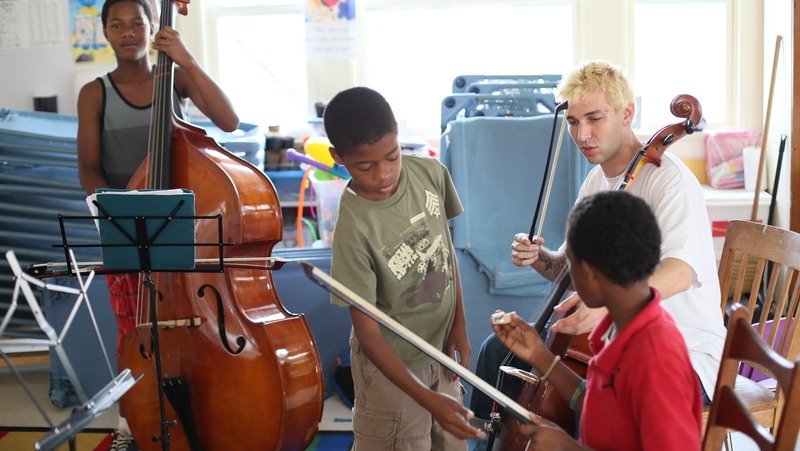 Inspired by El Sistema and the Venezuelan Youth Orchestra System, Make Music NOLA, originally began in a converted Walgreens in New Orleans’ Lower 9th Ward in 2011 with just five students. Over the last three years, the program has grown to over sixty students in four different schools throughout the city. MMN is made possible by the support and hard work of many people. Our dear friend, “Mr. Todd”, has had a strong impact on our students. Last April, we got a phone call from Ed Vigdor on a Monday evening saying that Todd was in town and wanted to come visit the kids on Wednesday afternoon. Our students got out of school early on Wednesday, so we pulled together a quick field trip to the Lower 9th Ward Village where we participated in a New Orleans’ Airlift Music Box House building workshop with local artist Dawn DeDeaux (she’s also a Todd fan!) and our students rehearsed and prepared for Mr. Todd’s visit! We were surprised and humbled to find out that our friend had walked all the way to the Lower 9th Ward to hear us perform and spend some time with us. His visit was brief, but very meaningful, the kids wore their Todd shirts from a year ago and on 24 hours notice, everyone showed up for the field trip that day because they wanted to see Mr. Todd again! We were very excited to hear that he was pleased with our student’s musical progress. As our program keeps growing and expanding, we are very happy to have the Spirit of Harmony Foundation continually involved. This fall, MMN will start its first brass program in East New Orleans. Look out for our trumpets and trombones. For more information, visit: www.makemusicnola.org. Laura Patterson is the Executive Director of Make Music NOLA. Her previous work experience includes the Cultural Programs Divisions at the U.S. Department of State and the Organization of American States, C.W. Post Chamber Music Festival, and New York Youth Symphony’s Chamber Music Program.